Our vision and desire is to see that the children at Masigcine are reunited with their parents; fostered or adopted into loving families. It gives us great joy to share that since September 2007, 22 little children have left Masigcine of which 18 children were reunited with either their immediate or extended families; 3 children are now in loving foster homes and 1 child is now living at the SOS Children’s Village. Masigcine has the capacity to accommodate 28 children. Recently we have exceeded this number because we realize the importance of keeping siblings together and we needed to accommodate this. Our children live in a hygienic environment; receive nutritious daily meals and a lot of TLC from loving staff members. A fun and yet structured activity program has been introduced which gives the children a variety of daily play sessions including coloring in; puzzle building; painting; playing with clay; story time; structured outdoor games; separate girl & boy time to play with appropriate toys etc. We have found this to be very rewarding for the child and the involvement of the staff is phenomenal. 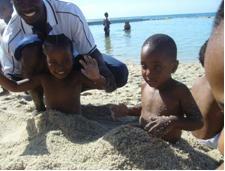 Our children visited the Strand beach for a morning’s outing in March and this month, went on a train ride from Cape Town station to St. James beach. What an experience it was for these little ones! (See our gallery page for the photographs). 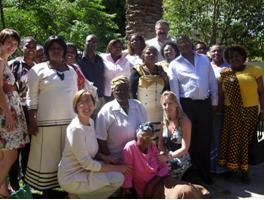 The staff and board members enjoyed a lovely Christmas lunch at Schoongezicht Restaurant during December. The ladies looked so pretty in their outfits. Rev. Lucas Plaatjie, the Chairman, thanked the staff for their dedication and hard work during the year and encouraged them to continue to keep the Masigcine Children’s Home name high. They received a Christmas gift and a letter notifying them of a market related salary increase. It was a lovely, happy day for everyone. In March we sadly said goodbye to Michelle, our Manageress, after a year of dedicated service at Masigcine. She decided to return to her family in the UK. The children, staff and board members miss her dearly and wish her all the blessings in return for what she did for the children at Masigcine. We have developed a wonderful relationship with an agency called AVIVA who screen international volunteers and place them with us. We were very blessed to have Jennifer and Amanda from Canada who came as our very first volunteers to stay at Masigcine for 12 weeks over December & January. Danielle from the UK is now with us as well as Sue, who also resides from the UK. Their help is invaluable. Please visit the website www.aviva-sa.com to view a YouTube interview of the volunteers visit.